Thank you for visiting this site if you are and old friend who has found the new format or an angler that has wandered in for the first time. I hope you enjoy it and find lots of useful information. I hope to see you in person soon either in the store on on my boat. Take a minute to sign my Guest book and leave a comment. Summer Hours: Monday thru Saturday 6am to 6pm. Sunday 6 am. to 5pm. I spent a great day on the water with Capt. Dennis Wheeler on the "Ballena", Flagship of the Parlama Sportfishing Fleet. We left Marina Pez Vela out of Puerto Quetzal and along with this Sail Fish that I released we released another and filled a cooler with great eating Dorado. We also managed to land a Wahoo that didn't get his razor sharp teeth on the mono leader. Even better than the fishing was the discussions with Capt. Dennis that will let us set up the best Tropical Fishing Packages available at the best possible prices. Jump on over to the FishGuatemala Section to see much more. and to keep up to date on all the latest info CLICK HERE to go to www.facebook.com/parlamasportfishing page. Be sure to CLICK LIKE when you get there. Hot Summer Fishing is Here! I have lots of information and all the daily reports and updates on Facebook. Please go to the Parlama Sportfishing Page www.facebook.com/parlamasportfishing While your there be sure to "LIKE" the page so you will get the updates right on your news feed. I have a couple slips available for the remainder of the season. we're about halfway thru so I will take 1/2 the original price. $500 for a 16' boat or $600 for a 20' boat. 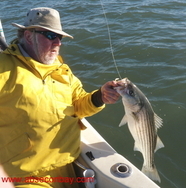 This is good thru the Striper Season or until we ice up so you're good for the year. M & B is working 100% after Hurricane Sandy and working with all insurance companies. I am very happy to announce a welcome change in my buisness with a Partnership with "M & B Marine". 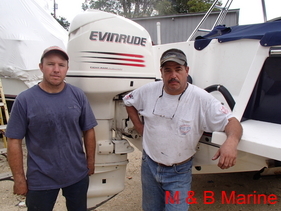 Mike Musarra and Bob Fricke are two of South Jersey's finest Marine Mechanics with almost 30 years of experience each. They will be taking over all the boat and motor service which will include all the winterizing, shrink wrap and winter storage. If you want the very best care for your floating baby please click on the following link for complete information. 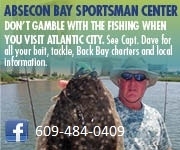 If you want to get in on the action there is no better way than to join me on an Absecon Bay Striper Safari where we will explore the Back Bays and near Shore waters from Little Egg Inlet to Great Egg Inlet and all the waters in between in my 20' Scout powered by a 175 hp Suzuki four stroke outboard. We will be using a combination of Live Bait such as Live Spot and Live Eels or when appropriate using artificial lures.